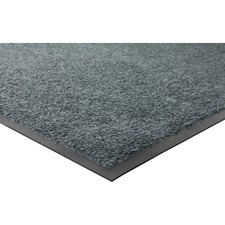 Scraper/wiper mat is part of a three-mat entry system for comprehensive defense to stop soil and water from entering the building while it protects floors from damaging debris. Use indoors for medium to heavy traffic. 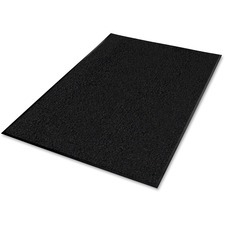 Slip-resistant vinyl backing holds mats in place to prevent falls. The top fibers are made from 100 percent recycled PET content, which prevents up to 96 bottles per mat from entering landfills. Indoor scraper/wiper mat is the second mat in a three-mat system that includes a Skilcraft entry-scraper mat (sold separately) and a Skilcraft wiper mat (sold separately). 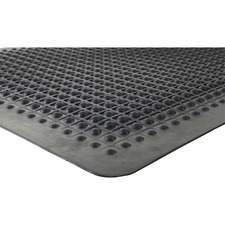 Anti-fatigue mat helps prevent body aches associated with standing all day. Safe, nonslip surface with ribbed vinyl reduces the risk of falls and combats fatigue. 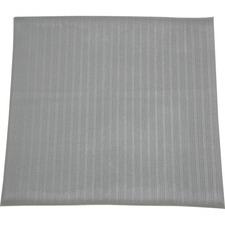 By combining softness with support, the mat allows proper distribution of body weight while reducing impact on joints. As the foot presses into the mat, the matting pushes back to increase blood flow. The result is less stress, greater comfort and increased productivity. Mat is designed for light-duty to medium-duty for dry areas. Beveled edges help reduce tripping. 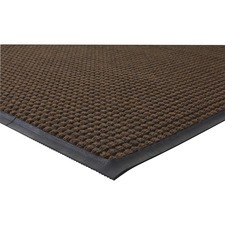 Closed-cell PVC, sponge matting offers comfortable and economical fatigue relief. The mat is 3/8" thick. 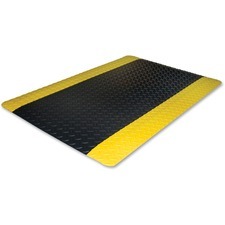 Anti-fatigue mat is made of chemical-resistant, nonflammable 9/16" thick material with beveled edges and yellow borders for additional safety. Ideal for workshops and factories. Grease-resistant and oil-resistant design helps prevent slips. Made with durable rubber, these mats are both beautiful and strong. Sleek design provides a perfect match to a variety of rooms. Solution-dyed, nylon carpet powerfully traps dust and moisture below the surface as traffic enters your building. 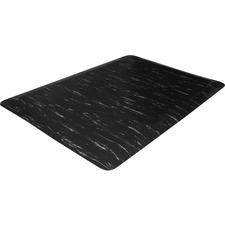 Marble patterned anti-fatigue mat helps reduce fatigue from prolonged standing and increase productivity. Ideal for general office, copiers, teller stations, service counters, light-industrial dry-area assembly lines, airports and banks. Top surface is puncture-resistant and flame-resistant. High-density foam backing provides superior comfort. Beveled edges help reduce trips and falls. 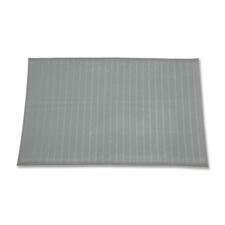 24" wide x 36" deep x 1/2" thick mat is easy to clean. Just wipe with a dry or damp cloth or wash top surface with water and mild soap. 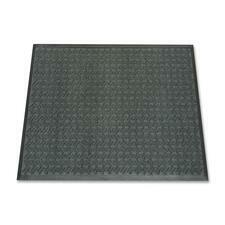 Dependable floor mat effectively traps dirt and moisture on contact to protect your floor's surface. Bi-level construction traps dirt below the surface to maintain high efficiency. Durable rubber backing grips to the floor surface to prevent frequent adjustments. Edges are sloped to help prevent trips and falls. Reinforced ridges keep the scraping tips rigid enough to withstand high-traffic areas.